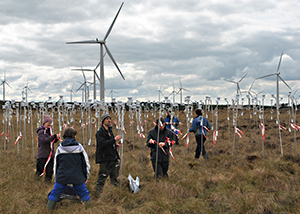 Newly published research shows that the action of wind turbines has a measurable effect on the local climate, but this is unlikely to affect carbon storage in peatlands, where the majority of Scottish wind farms are located. Researchers from the Centre for Ecology & Hydrology, National Centre for Atmospheric Science, the University of Glasgow, Lancaster University and the University of Leeds placed a grid of more than 100 temperature and humidity sensors around wind turbines at ScottishPower Renewables’ Black Law Wind Farm in North Lanarkshire. Over six months, the scientific team took readings from the air every five minutes and from the surface and soil every 30 minutes, including during a period when the turbines were switched off for maintenance. They found that when the turbines were operational at night the temperature around the turbines increased by nearly 0.2 °C and absolute humidity increased fractionally. The turbines also increased the variability in air, surface and soil temperature throughout each 24-hour cycle. 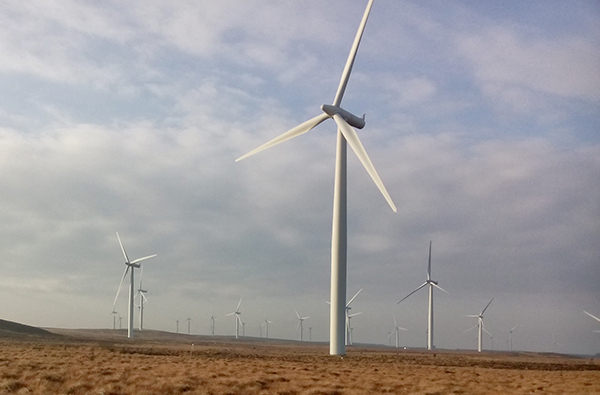 The study was supported by funding from the UK Natural Environment Research Council (NERC), and access to Black Law Wind Farm was provided by ScottishPower Renewables. The paper, titled "Ground-level climate at northern peatland wind farm is affected by wind turbine operation", is open access in the journal Environmental Research Letters.